SALES FOR WEEK OF 4/29 -5/5 The following sale info has been obtained from national circulars. You may live in an area that does not run national sales, so if you do not see these sales in your area, check with your store manager for more details. 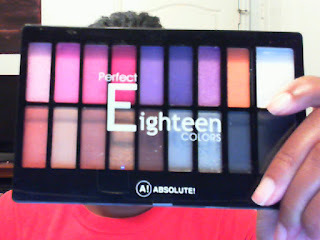 THE PERFECT EIGHTEEN COLORS EYE SHADOW PALETTE BY NICKA K NEW YORK ! This palette is one of the most affordable palettes I have ever purchased. The colors are pigmented and there is minimal fall out! I am extremely happy with my $2.99 purchase from my local Beauty Supply Store. These palettes can be found locally (Dallas,Texas) for as little as $1.99. There are two types the ECLIPSE & PAPARAZZI. The Eclipse Palette shown in the top photograph There are various shades ranging from deep purple, bright orange, matte white and black. The lower portion of the palette can be used for a neutral eye or a dark smokey eye. This palette can be for the daring or the timid! The Paparazzi Palette should have been call the Rainbow palette! It has a gorgeous arrangement of colors from matte white to a BOLD red! It's a makeup artists dream. Bright yellow and mint green are also among the group. SUBSCRIBE TO MY BLOG and WIN! GIVEAWAY END's May 10th! "Enter me into Stallion1920's BETTY BOOP Giveaway"
Welcome to Stallion1920's Blog! It's a work in progress. The purpose of this blog is to express my opinions about the latest fashion, cosmetic and fitness trends. I will also promote health related topics including workouts and dieting.